Dr. Andi Kleinert is passionate about providing you and your family the best, evidence-based, compassionate and patient-centered medical care throughout all stages of life. She thoroughly enjoys the practices of family medicine and urgent care and partners with you to develop and achieve your optimal health. Dr. Kleinert earned her medical degree from the University of Colorado and completed her internship and residency training in family medicine through St. Anthony Family Medicine Residency program. She serves on a local Primary Care Advisory Committee and is currently involved in quality improvement projects in her clinic including Patient Centered Medical Home. Dr. Kleinert is trained in women’s colposcopy through the American Society for Colposcopy and Cervical Pathology. She is board certified by the American Board of Family Medicine. 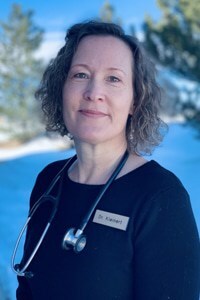 Her current associations include Arapahoe, Douglas, Elbert County Medical Society, the Colorado Medical Society and the American Academy of Family Physicians. Dr. Kleinert served in the military as active Army and Colorado National Guard. Outside of work, she enjoys spending time with her family and friends in the great Colorado outdoors!